Zombie Guys are undead red Shy Guys that appear as enemies in Yoshi's Crafted World. They are distinguished from other Shy Guys by their staggered, sluggish walk, as well as by their dirt-tainted clothing. 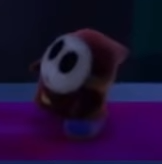 They are introduced at the beginning of Haunted Maker Mansion when they come out of the ground during a lightning strike and continue to appear frequently throughout the level. Zombie Guys are usually found walking slowly in one direction, turning the other way when they encounter a wall, an edge or another enemy. One of them stays in place at the beginning of the level, but proceeds to shuffle towards Yoshi when he comes close. Although Zombie Guys are able to damage Yoshi if he runs into them, they can be defeated by any sign of attack, including a jump or an egg throw. Yoshi can also eat and swallow a Zombie Guy to produce an egg. While most Zombie Guys are encountered normally on Yoshi's path, others spawn from ground burrows. When a Zombie Guy that came from a ground burrow is defeated, another one will spawn from it. ↑ Nintendo (November 1, 2018). Yoshi’s Crafted World - Gameplay - Nintendo Treehouse: Live. YouTube. Retrieved November 2, 2018.